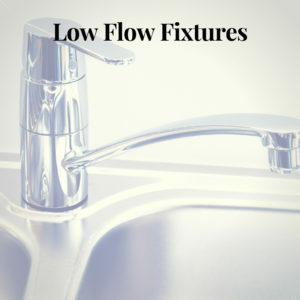 Plumbing fixtures that significantly reduce the amount of water released per use are labeled “low-flow” or “low-flush.” These fixtures use just enough water to be effective, saving excess, clean, drinking water that usually goes down the drain. Toilets are one of the main sources of wasted water, accounting for 40 percent of water use in a home with older models using up to six gallons per flush. Faucets and showerheads are also water-wasting culprits, with showerheads accounting for 18 percent of indoor water use and 37 percent of a home’s hot water use. Installing low-flush or dual-flush toilets and flow-reducing faucets and showerheads can significantly decrease a home’s water use. Low-flush toilets use 1.6 gallons per flush or less and are just as effective as older models that use more than twice that amount. Another option is dual-flush toilets, which offer an ultra-low flush of 0.8 to 1.1 gallons for liquid waste and 1.6 gallons for solid waste. Flow reducers for faucets and showerheads and pedal-controlled faucets can also significantly reduce a home’s water use, and its monthly water bill.